When coming across a recipe that called for sweet potato flour I was intrigued as despite having seen, bought and tried many ‘weird’ types of flour, this was not one I’d come across. After a quick internet search I realised it wasn’t going to be easily available so decided to have a go at making my own. Whilst it took a number of days, it certainly wasn’t at all difficult and was, in the end, worthwhile. The recipe I wanted to try called for 1&1/3 cups of sweet potato flour, so that was my target. It took 2 dehydrators ‘worth’ of sweet potato, which for the size of my dehydrator was about 3 largish sweet potatoes, which is the only ingredient. 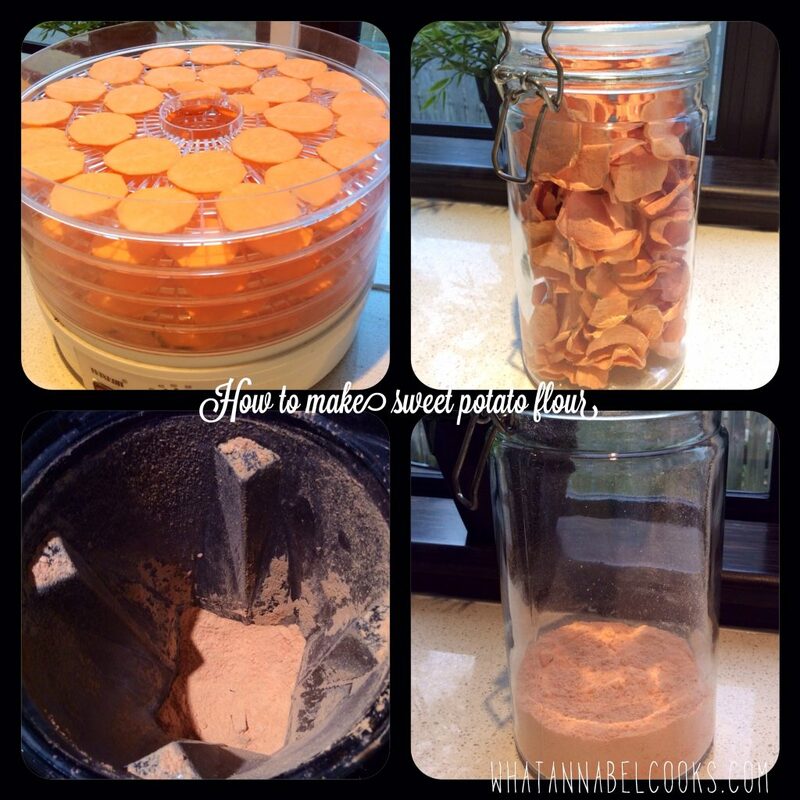 Peel and slice finely (use a mandolin if possible for consistently thin slices) sweet potatoes (enough to fill your dehydrator). Dehydrate until crisp. Mine took about 16 hrs. (Easiest to do overnight). If you just want to make sweet potato ‘chips’ you can stop here! I nibbled on a few and they were a little moorish. When cooled and crisp pulse in high speed blender/thermomix if you have one until fine enough for a flour-like consistency. Repeat process until you have enough flour for what you want to bake!